An advanced pose from the Ashtanga Yoga Series, Half Bound Lotus Pose or Ardha Baddha Padmottanasana requires deep stretching and extending of the body in a Forward Bending Motion. Challenging the flexibility level of the practitioner, this pose goes a long way and works profoundly. Apart from the physical self, the body also works on the mental and emotional self of the students because it allows him or her to learn the language of the body and not force oneself into performing the pose in its entirety, at least initially. Half Bound Lotus Pose is referred to Ardha Baddha Padmottanasana where ‘Ardha’ means ‘Half’, ‘Baddha’ means ‘Bound’, ‘Padma’ means ‘Lotus’, ‘Ut’ means ‘Intense’, and ‘Asana’ means ‘Pose’. Let us understand how to perform this pose in a step-by-step manner in order to avoid any injuries. We would also talk about the benefits of Ardha Baddha Padmottanasana, modifications and contraindications of performing this pose. Step 1: Stand in Tadasana at the center of the mat and gather your breath. Now, shift the body weight on the left foot, and heavily press the toes of the left foot into the mat. Step 2: Maintaining a sense of balance in the pose, lift the right leg and bend the knee so that it touches the chest. Straighten the right leg and bend it from the knee to place the right heel as further high as you can on the left thigh. The sole of the right foot will face the ceiling while the top of the right foot will be rested on the left thigh. Step 3: Without any unwanted pain, gently bring the right knee down to bring it in line with the left knee. Please note that at no point in time should one force themselves to perform this pose. They can start with a variation mentioned below and gradually work their way up. Step 4: Fix the gaze on the floor in front and hold the right toes with your left hand to get ahead with the pose. Elongating the spine, lift the right arm up to get an extra lengthening in the torso. Now, from behind the back, wrap the right hand to hold the right toes. Initially, the practitioner can hold the left arm, if holding the right toes is difficult. Step 5: Inhale and lift the left hand up to again gain length from the torso and start to bend from the hips to enter into the forward fold. As you hinge forward from the hips, gently place the left hand on the floor next to the left foot. Draw the chin towards the chest and if you can, place the forehead on the shin or knee. Step 6: Hold the pose for 3 to 5 breaths. In order to come out of the pose, start by lifting the torso back to an upright position. Moving in a chronological order, unbind the left arm and gently unfold the right knee to place the right foot back into Tadasana. Step 7: Perform Ardha Baddha Padmottanasana on the other side in a similar manner. Ardha Baddha Padmottanasana is designed to test a practitioner’s strength, flexibility, balance, and focus. Naturally, there are multiple steps where the modifications and variations can be used. In order to keep a right form, it is advised that the practitioner place a yoga block next to the left foot (vice-a-versa) and place the left hand on it and gradually build their way to place the hand on the floor next to the left foot. Diligently practice the asana till Step 4 because the pose comes with a strict instruction of ‘No binding, No bending’. This is to say till the practitioner cannot hold the toe of the raised leg from the opposite, they should not start with the forward fold. Stay in Ardha Padma Vrksasana or Half Lotus Tree Pose. By working on the balance and flexibility of the body, it tones the mind and brings the focus inwards. This creates a sense of calmness and serenity in the minds of the practitioners. People suffering from high BP, headaches, migraines, and glaucoma should avoid this pose. 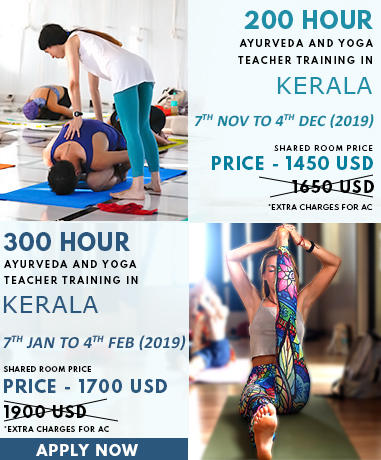 To know about Half Bound Lotus Pose in further detail, explore our Yoga Teacher Training In India.